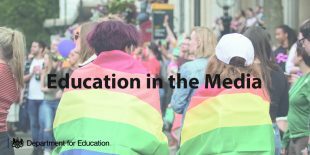 Today’s Education in the media blog looks at new statistics published by the Office for National Statistics on the size of the LGB population in the UK, and maths expert Johnny Ball’s comments about mathematics in schools. On Tuesday, 4 October, the Office for National Statistics published an update of the estimate of the size of the Lesbian, Gay and Bisexual (LGB) population in the UK based on the 2016 Annual Population Survey. This was reported in the Guardian , the Sun and the Independent. The statistics show that one in fifty Britons say they are lesbian, gay or bisexual which is 2 per cent of the UK population, up from 1.7 per cent in 2015. The largest proportion of the population who identified as LGB is living in London and is above average at 2.7 per cent. This government is committed to building an inclusive society that works for everyone, no matter what their gender or sexuality and we invite as many people as possible to respond to the survey before it closes to help us build a more equal United Kingdom. The link to the statistics are available here. These statistics help us better understand our diverse population. Everyone should be able to be proud of who they are and live free from discrimination. That is why we have invested £3m in projects to tackle homophobic, biphobic and transphobic bullying in schools. We’ve also launched a nationwide survey so we can provide a more equal United Kingdom for LGBT people. The survey closes shorty so I would encourage those who haven’t yet responded to have their say. Today, Thursday 5 October, Johnny Ball, a well-known maths enthusiast, was interviewed by Good Morning Britain. He talked about the history of maths and teaching maths in schools. We welcome his acknowledgment that there are great maths teachers who really promote the joy of maths. As well as introducing the new national curriculum, we have created a national network of 35 school-led Mathematics Hubs to help local schools improve the quality of their mathematics teaching based on best practice. “Maths is a vital life skill and that’s why we’re making sure our curriculum matches the best around the world. This year’s key stage 2 results show our reforms are already starting to raise standards.